This book is written exclusively for women from the outlook of a woman. The first section, on spirituality, describes the important role of women in social and spiritual evolution, and traces their development from menarche to menopause. The second section discusses special applications of yoga for backache, depression, menstrual irregularities, pregnancy, prolapse, overweight and others. 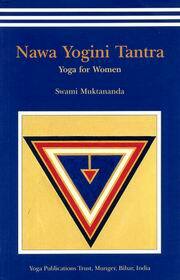 Each chapter inspires the woman to help heal herself and regain her divine power through the practices of yoga. The third section deals with yoga sadhana and includes a guide to yogic practice, explaining where, how and when to practise. Techniques are divided into three levels: beginners, intermediate and advanced. Important reference for yoga teachers. The Author is a direct disciple of the Founder of Bihar School Of Yoga, Swami Satyananda Saraswati. She is also the Author of the famous Book Hatha Yoga Pradipika.